Monday November 29th 1926 I finished packing and did some telephoning. Cora took out the big car as the ice is all gone and they took me to The Station. I found Mrs Raymond there with her sister whom I had for company to Chicago. Went out to Winnies by taxi. A pleasant evening with her. I was rather tired. Went to bed early. Fine weather. Tuesday November 30th 1926 I wrote Hattie and threaded some beads. In the afternoon Winnie and I went to call at her nephews and on to the Chrysanthemum Show at Garfield Park. Spent evening at home. 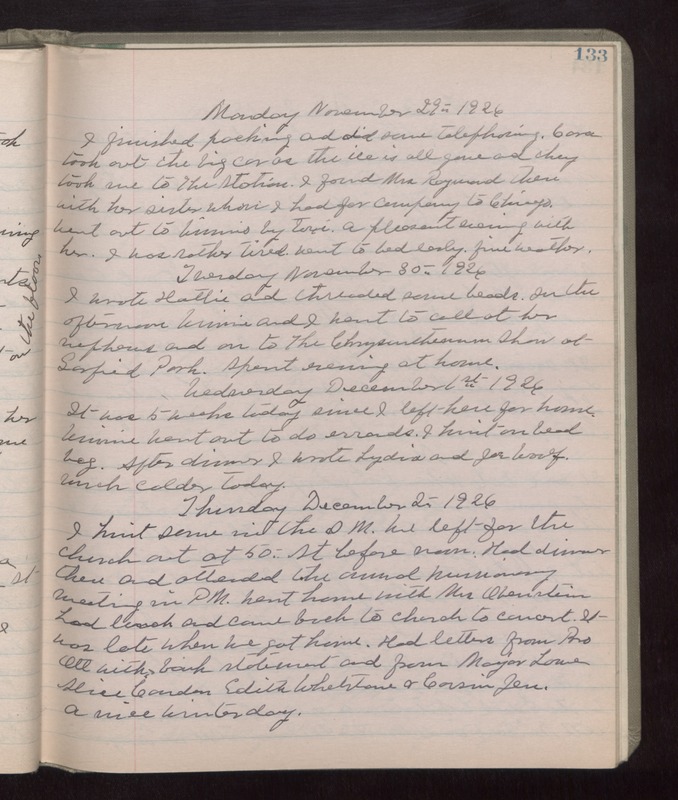 Wednesday December 1st 1926 It was 5 weeks today since I left here for home. Winnie went out to do errands. I knit on bead bag. After dinner I wrote Lydia and Joe Woolf. Much colder today. Thursday December 2nd 1926 I knit some in the AM. We left for the church out at 50th st before noon. Had dinner there and attended the annual missionary meeting in PM. Went home with Mrs Obenstein. Had lunch and came back to church to concert. It was late when we got home. had letters from Bro Ott with bank statement and from Major Lowe, Alice Condon, Edith Whetstone & Cousin Jen. A nice winter day.